Most of the time, my journeys (especially short term) are unplanned. I usually don’t sit and schedule them as I am always not sure if I will be stretching myself for them. However my long term journey (from Delhi to Kathmandu) was too an unplanned event where I had mixed situations of trouble and pleasure. Considering how I plan to travel, it’s always I sleep with no plan and next morning I just run. 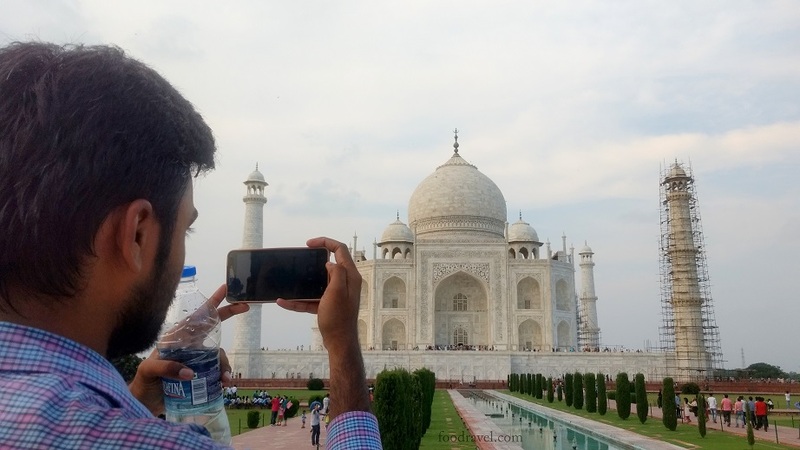 So, this time, I visited Agra and spent a day at Taj Mahal. 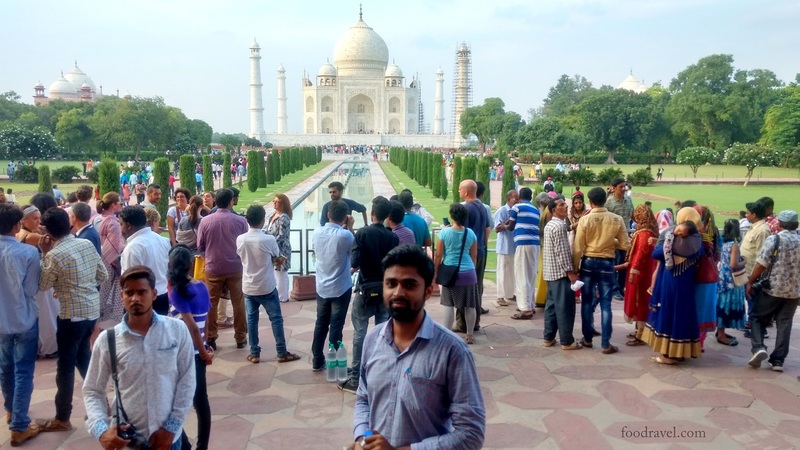 Again a story of unplanned journey which started from Gurgaon, a visit to Agra to spend a day at Taj Mahal, was an event of little trouble with good moments. The day before my journey, I was travelling to Gurgaon back from my hometown, Mahendergarh and was on phone with a friend. I reached Gurgaon at around 10pm. By the next morning, I decided to go. Well, I didn’t know how to reach there, which train to catch, and I was totally dependent on my friend with whom I had to travel to Agra. Generally, people visit Agra to see the beautiful Taj Mahal. I too had to experience this. I have been staying here for long and never visited Agra which was not a good thing as Agra isn’t too far from Delhi. One can go and return the same day if the trip to Agra is planned properly. Well mine wasn’t a pre – planned journey, still I managed to return the same day. I left Gurgaon at 6am in the morning and headed towards metro station. There are two metro stations i.e. MG Road and Huda City Centre which are almost at the same distance from the location I stay, still I prefer to go Huda City Centre as it is the last metro station of the Yellow Line, thus one can get a seat from here. It’s better to leave early as the roads in Gurgaon get congested by the peak hours. I reached Huda City metro station and boarded in. It took me around an hour to reach there as the traffic was thick which often creates trouble when you are in hurry (Murphy’s LawJ). I had to reach Kailash Colony metro station around 8am and from there along with my friend we had to reach Nijamuddin Railway Station. From there, we had to catch train to Agra. Though I was running out of time and at a moment, I thought I wouldn’t be able to make it; I called my friend and asked to cancel the plan. But on being convinced that we would make it certainly, I had to cancel the plan of cancelling the trip to Agra. I finally reached Kailash Colony around said time 8am and waited for my friend. From there, we both booked an auto and headed towards Nijamuddin Railway Station. The guy charged us Rs.80. He didn’t turn on his meter. On being asked that why he had turned off the meter, he said that the meter had some technical troubles and thus wasn’t working. My friend told me that these were the tantrums of these auto wallas. We were already running out of time and traffic jam welcomed us at every red lights. While we were on the way, I saw that the driver leant down and turned on the meter from a switch under his seat. I told my friend that he turned on the meter. It’s really not a cup of tea to deal with these auto wallas. While we were on the way and already running out of time, my friend suddenly reminded that she had forgotten some important thing at her PG. We had to get down on the way and got another auto back to her PG. And that’s how we missed our train to Agra. It took her five minutes to come back from her PG with what she forgot (I have no idea). We were again covering the same path to railway station. We reached the railway station and got our tickets of general coach. And we entered in an AC coach. I asked her how that was possible. She told me that would handle on her own and asked me to stay calm. So, the train started to move slowly and within few moments, got its speed. We had breakfast which she got from her PG. A person came to check our tickets. We had tickets of unreserved coach, so we paid Rs 900 extra for the reservation (for two seats, as far as I know). 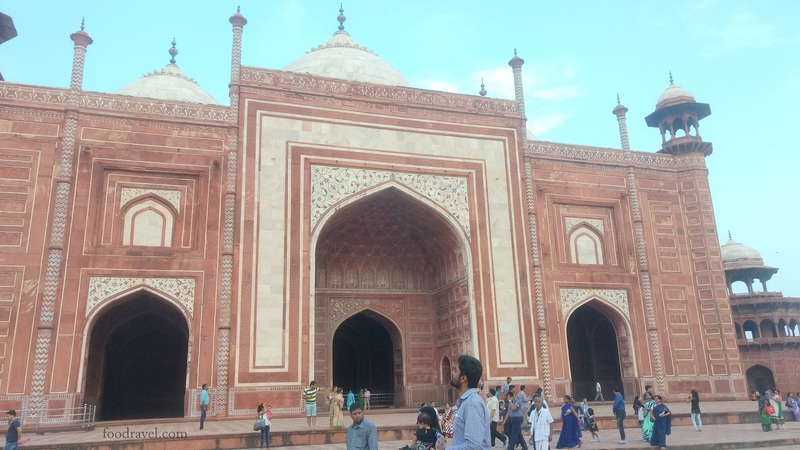 Within three hours, we reached the city of Taj Mahal. She called her father. And her father came to pick us. We headed to a mall and she all of sudden planned to watch Pink movie. On the way, I and her father talked a lot and enjoyed. When we reached the mall, first we had some snacks at MacD. And then we went to watch the movie. We finished the movie, which was a good time pass (let’s not talk about the movie). We headed towards Taj Mahal in the car. When we reached near to it, we stopped at her uncle’s home. His uncle owns the famous sweet shop. 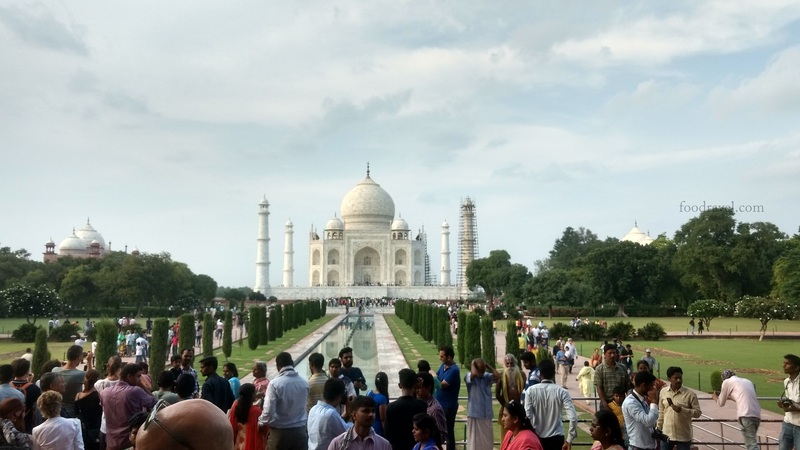 Taj Mahal is just one minute walking distance from her uncle’s place. We both reached the entry gate. But there was no ticket counter and were asked to go to South Gate where we could buy tickets. So, we walked to South Gate which was around five minutes’ walking distance. There we got tickets and moved in the entry queue. I had a bag and the security personnel didn’t allow me to enter without the bag. We had to return to her uncle’s home, there I placed my bag and entered from the same gate we were at first. There was tight security at the gates and the security guards were checking each and everything thoroughly. And finally we entered. The place was well secured and was crowded that day (or may be every day). Schools kids, families, native, foreigners, people from different places were there to experience the world famous architectural beauty of the country. There is a huge entry gate which leads us to the main building. The main building is surrounded by huge land mass covered with gardens which green and coloured plants. There is a platform at some metre distance from the main building which is connected by a water body. People were enjoying capturing snaps in several postures. We too did. I prefer random shots; I usually don’t look straight in the camera (if it isn’t an official photo for documentsJ). There were many photographers who were charging per snap while most of the folks had their own camera, phone, digital, DSLR etc. The main building is surrounded by three other buildings i.e. left, right and front. These three are red in colour. The main building is white in colour as we all know. The main building which we see in pics, is built on a huge platform which is high above the ground level. Taj Mahal is not just what we see in pictures, one has to spend the whole day here to explore what is left in the pictures. The main building was under maintenance and one minar was being worked upon. Everything was quite beautiful and eye soothing. This was such a wonderful experience; however I couldn’t enter inside the main building and left it on my next visit. Moreover, I had to return to Gurgaon the same day and it was already 6pm (the movie consumed time). Moreover, I couldn’t enter the main compound as we didn’t carry shoe covers. Entering the main compound with shoes is prohibited as that is a prayer place. So if you want to visit the prayer place, you either need to buy shoe cover from outside or you will have to put out your shoes at same safe place and ask your fellow to look after (this idea didn’t approach me), so I decided to visit the main building next time. The sun had started to spread orange hue by the time. I had a quality time with my friend and this unplanned visit was a wonderful one. 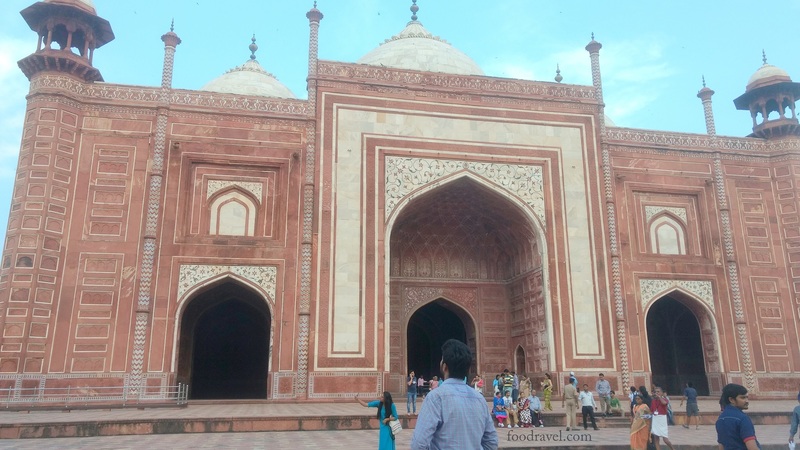 In my next post on Agra and A Day at Taj Mahal, I will talk about the history of this beautiful piece of ancient Indian architectural beauty (obviously on my next visit to Agra and A Day at Taj Mahal). It takes somewhere two and half to three hours from Yamuna Expressway to Agra as reported by a friend who visited Agra followed by my visit. If you are a nomad and don’t have any personal vehicle, return to the railway station, buy a ticket back to Delhi. It confused me for a moment when I was told that I could have buses from ISBT. So there is ISBT in Agra as there are in Delhi (I didn’t know this). And there is Sadar Bazar (there’s one in Gurgaon and one in Delhi). There is MG road (as there is in Gurgaon). It was not that much confusing though. After roaming around and experiencing the historical monument, we returned back to her uncle’s, picked up my bag. I bought a 1KG box of Kesar Petha from her uncle’s shop and we headed to the bus stand around 7pm. From there, I had a bus to ISBT Delhi. I reached there at around 12pm. The bus dropped at Sarai Kale Khan and from there I reached ISBT Kashmiri Gate. It was around 1am and the road was all blocked at this odd hour of midnight due to metro construction work. I reached Kashmiri Gate ISBT. I sat on a chair. I had to spend next six hours at this place as I had nowhere to go. The main gate of my building remains closed after 11pm and I had no access to unlock it. So I thought to spend some time there only. I kept on sitting there, had some sleep. By the time it was 6am, I went to metro station, boarded in the metro and returned back to my place.